The Husqvarna 327PT5S pole saw can reach up to 13 feet. This Husqvarna pole saw (327PT5S) is the type of tool that will quickly become your best friend if you do a lot of pruning from a distance. Extendable up to an impressive 13 feet, this 24.5cc pole saw will cut through branches like butter. Ideal for cutting branches up to 8-inches in diameter; although you can cut larger branches, but it will take you more time. I like the fact that it comes with a safety harness to reduce the stress on your arms as your cutting. This is a fairly heavy pole saw at 31 pounds so the included harness is a nice added bonus. Also, it prevents you from overextending your reach and encourages optimal safety operating procedures. Although, you don’t have to use it if you don’t want. The choice is ultimately yours. The included balance flex harness for added safety. Pruning trees is challenging work and is also tough on your body as it may put you in awkward and unnatural working positions. This is a professional pole saw designed to help you work in an ergonomic and efficient manner. Yes, you can buy cheaper pole saws but cheaper doesn’t mean better. Husqvarna is one of the top chainsaw manufacturers in the world — if not the very best — and this pole saw is a great example of their commitment to quality. Also, if you purchase this pole saw with three cans of Husqvarna pre-mix fuel and register your product online, your warranty will be extended from 2 years to 4 years. That seems to be a nice bonus from Husqvarna. Four years is an excellent time frame for a warranty. Remember you have to buy 3 cans of the Husqvarna pre-mix fuel. Watch this Husqvarna pole saw up close and personal. You can see for yourself how well-made and sturdy it is. Read the full offer here: Husqvarna Extended Warranty Program. 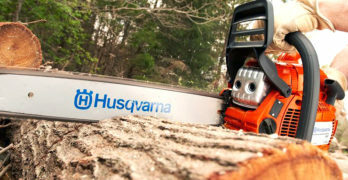 This warranty offer extends to all of their 2-stroke, gasoline-powered products, so if you’re in the market for a gas chainsaw be sure to read our guide on the best gas chainsaws for homeowners, as we have many Husqvarna products on the list, and if you do buy one then make sure you purchase the right amount of 2-stroke pre-mix fuel for the extended warranty. Husqvarna pre-mixed fuel & oil. This Husqvarna pole saw has many useful features that you can see an overview of in the image below. Sometimes it’s much easier to see it visually than to read the words. If you click the image you’ll get a larger version to see more detail. Features of the excellent Husqvarna 327PT5S pole saw. Is this Husqvarna Pole Saw for you? Well, if you’re willing to pay for a quality pole saw that will last you a long time then I think this is an excellent choice. Trust me, you could do a lot worse. It’s highly versatile, allowing you to reach dense trees and bushes without the aid of a ladder or cherry picker. Relatively lightweight, well-balanced, with a rear-mounted engine that provides you with an ergonomic working position with less exhaust fumes. If you do a lot of pruning from a distance then this should be at the top of your list. You can’t really go wrong with Husqvarna. If you’re looking to spend less money but still want a quality Husqvarna pole saw then you might like the Husqvarna 128LDX pole saw (28cc, 10-inch) which only reaches up to 9-feet. If you’re on a budget then it’s a great choice as well. Just make sure the branches you need to cut aren’t over 9-feet, otherwise it’s a waste of your money. Ergonomic harness. Flexible suspension to reduce stress on arms in all working positions. Rear-impact guard to protects the engine. Stand alone starter enables you to easily change starter cord if necessary. Automatic chain lubrication with adjustable controls. Highly efficient air filter, designed to increase engine life and lower maintenance costs. Non-CARB Compliant. Does not meet California emission standards. If you just want a cheap pole saw then you can save yourself some money and buy this Remington Pole Saw / Chainsaw combo. Model: RM1015SPS. I must say, that there’s no comparison with the Husqvarna pole saw and this Remington model. No offense to Remington, but they aren’t comparable. But, not everyone needs a professional grade pole saw. You have options depending on your needs and budget. For under $100 you get a pole saw and a chainsaw. Great deal. This Remington Ranger doesn’t compare to the Husqvarna pole saw so please lower your expectations but if you’re need a pole saw and don’t want to spend a lot of money this is an excellent choice. And, the chainsaw is removable so you truly get two products in one. 10″ Bar & Chain with an 8-Amp electric motor. Easy pole locking clamps quickly and effectively secure the pole length. Aluminum Poles are adjustable up to 15 feet. A good option if you’re on a budget. A very popular product with consumers. Convenient and affordable.